The Plumbing systems of your home deliver the cold and hot water that is available for the faucets at your sinks, tubs, showers, and Washing Machine. Your Plumbing system also includes the drains and the vent piping for these drains, which allow waste water to flow away from your home. In some homes, the water supply for the Plumbing system comes from municipal water sources, and for some homes the water supply comes from private wells. If your home has water from a private well, then you should also put a checkmark for Well Water in the Outside section of your home features in your Home Wizard app. In some homes, the waste water leaving the home goes into municipal sewer systems, and for some homes the waste water is treated on the property in a private Septic System. If your home has a septic tank, the you should also put a checkmark for Septic System in the Outside section of your home features in your Home Wizard app. Over time, drain pipes tend to clog with sediments. Also over time valves and fittings can begin to wear and develop leaks. 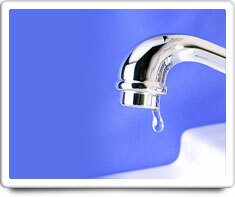 Small leaks can quickly become big leaks and cause major water damage. Shown in the 'Routine Care' section are the recommended routine maintenance tasks for your plumbing. The 'Q & A' section shows answers to common questions. And the 'Articles' section provides helpful articles about your plumbing.